For first time in the 26-year history of the Marine Aquarium Conference of North America, the organizers are providing free open access to the Program Book being given to attendees and exhibitors of the event. “We are very proud of this year’s MACNA Program Book,” says event chair Rob Mougey. 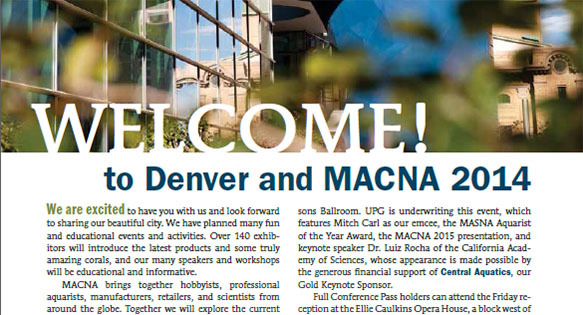 “We worked hard to make it user friendly and with a flavor of Denver’s vibrant reefkeeping community.” MACNA runs from August 29-August 31 at the Colorado Convention Center in downtown Denver. In addition to the conference schedules, the Book includes essays on the evolution of the marine aquarium hobby by Martin A. Moe, Jake Adams, and David Marriott, with images of local reef aquariums, and many new product launches by MACNA Sponsors. There is also the first public announcement of the location of MACNA 2015. This year’s program book was sponsored by Neptune Systems. 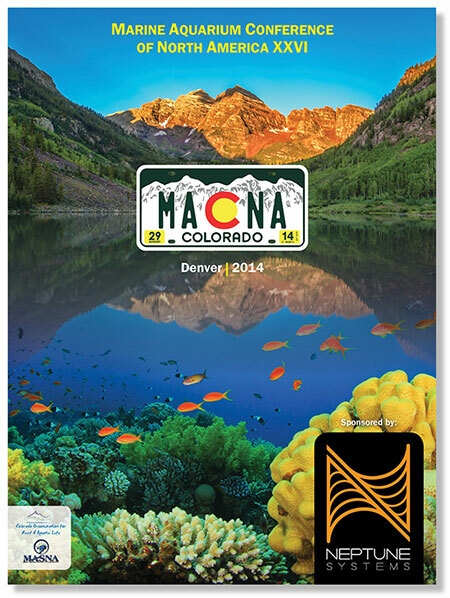 The Official MACNA DENVER Program Book available the door.